I would like to take this time to thank Andi’s Book Reviews for being a host for my book tour. Thank you so much for all of your support. It is greatly appreciated. Thanks again! L.L. The inspiration for this book/series comes from my love of the supernatural, fantasy, and Biblical influences that have strongly impacted my life. How much do you have in common with Syndey? Sydney’s character is actually inspired and based on me. There are so many different things that we have in common. Her educational background in Liberal Studies and Social Sciences was inspired by my experiences. Sydney’s career in the world of education is based off of my career in education. We both are teacher assistants. She works in a kindergarten classroom. Currently I work in a special education classroom, but I have over ten years of early childhood classroom experience. We both share the love of the arts, she and I love to draw, paint and be creative. We adore reading. My first car was a blue Ford Focus, just like the car Sydney drives. Our mom’s own a book publishing company, and our father’s passed away a couple years ago. I guess you could say that I am Sydney. What is one of your favorite scenes? Wow, that is a great question. There are so many awesome scenes, but I think that one of my favorite scenes is the one where Angelo finally reveals to Sydney that he is an angel—her guardian angel. He sends her a text message warning her that she is in danger. He tells her that the guy she is currently dating is a dark angel and is after her. Sydney quietly goes down stairs to reply to Angelo via text message and Angelo tells her he is coming over. She tries to stop him, but by the time she starts to text him back, Angelo appears in front of her in a large ball of white light. She is so shocked that she can barely process what she sees. That is when he tells her that he has always loved her and that he knows that she doesn’t love Gilad. You will definitely see these characters again! What is the appeal of the paranormal/urban fantasy genres for you as a writer? For me the appeal is the mystical elements behind the genre. It is how the genre draws out the many components of imagination within me. I can be anyone, go anywhere, and do anything. The elements are limitless. What is the appeal of the genres for readers? For readers I think the appeal is the same. Everyone wants to have that little extra special thing that can make them be a hero. They want to have that experience that takes them out of reality— out of the ordinary. The reader wants to be drawn into the adventure just as much as the writer does. This is such a competitive genre, with a large number of new books in the last few years. How do you make yourself stand out? Having such a unique concept— the blending of Angels, Vampires, Mythology and Biblical themes is what makes my work stand out. I’ve always wanted to be a writer, but as I got older other things got in the way of my writing. It wasn’t until about five years ago that I started to really pursue my dream of writing and publishing. I am working of finishing this series. 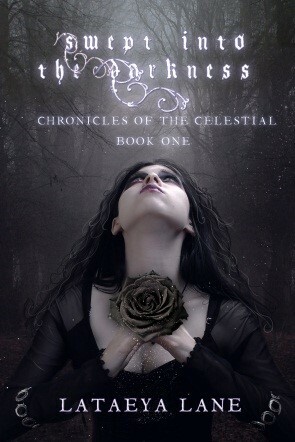 There are five books in this series: Dark Betrayal: Chronicles of the Celestial Book Two, Dark Revenge: Chronicles of the Celestial Book Three, Dark Defiance: Chronicles of the Celestial Book Four, and Dark Revelation: Chronicles of the Celestial Book Five. When I am not writing I read, but most of my time is spent playing with my 18 month old son. I think that readers will be surprised that Sydney’s character is solely based on me, my personality traits, and life experiences. No one has asked me that question before, so that was something new that I revealed about myself and the main character in my book. This was a great interview. I had fun participating. Thanks so much for having me.